Dental veneers are custom-made, thin pieces of porcelain put on your teeth by your dentist. A veneer is a layer of thin material placed over a tooth’s enamel. A veneer helps to protect the tooth’s enamel from damage, as well as fix cracks, chips, or misshapen teeth. Veneers can help fix something you don’t like about your smile so you can achieve the perfect smile you’ve always wanted. Do you try to hide your smile in photos or when talking or laughing? Many patients come to us that don’t love their smiles and are looking for a change. Porcelain veneers offer a chance to give yourself the smile makeover you deserve. Below are a variety of scenarios where you may want to consider porcelain veneers as a treatment option. Teeth can get broken through a variety of activities, whether it’s sports-related, kids playing rough, or an accident. If one of your teeth becomes cracked, chipped or broken, veneers can lay over top of your tooth, giving it strength and preventing more damage, as well as smoothing out your smile. Teeth become discolored due to different foods and drinks (like wine or coffee) staining them, using tobacco products, or just the natural aging process. Regardless, everyone wants a white smile. If whitening options haven’t worked for you, or you want a longer-lasting solution, veneers can give you the perfect white smile! If your teeth are misaligned, irregularly shaped or uneven, your dentist can use veneers to restore them to a natural appearance and dimension. Veneers can be used to transform a tooth’s size, color, and shape. If you have any of these dental problems, a smile makeover is highly recommended. A smile makeover is a process where a dentist conducts an assessment of your whole dental structure and mouth. After writing the analysis results and studying them, Dr. Imm will then discuss the results and help you to choose procedures to help you recover your smile. If you are thinking about getting veneers, we first recommend making a consultation appointment with Dr. Imm. He can get a better look at your teeth and bite, and decide if dental veneers are right for you, or suggest any other treatment options that might make sense.Your dentist will also most likely take x-rays to get a better picture of your bite and how he can help perfect your teeth. 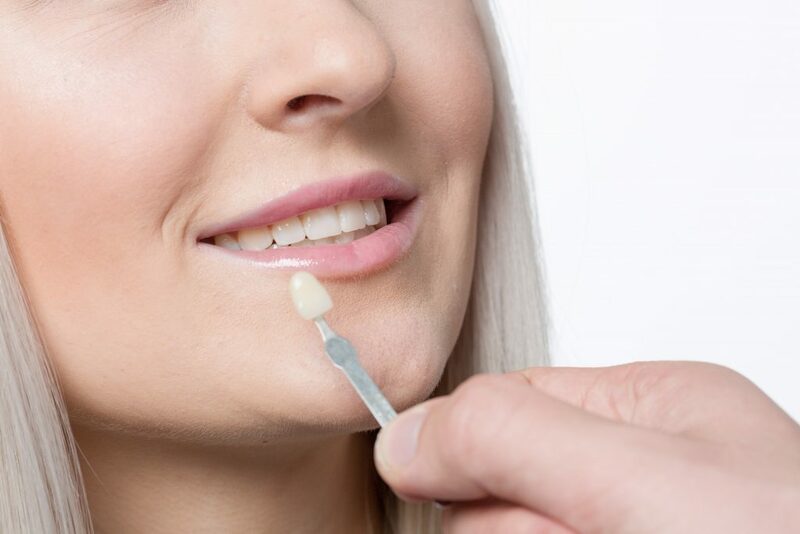 After you and your dentist have discussed the veneers process and have decided to move forward, your next visit will begin with your dentist preparing the tooth that will be receiving the veneer. First, your dentist removes some of your enamel from the surface of the tooth. Normally, the amount removed is equal to the veneers’ thickness that is to be added to it, so your teeth are a normal shape and thickness and feel natural. Since veneers are so thin, this means that not a lot of enamel is removed. Then, your dentist makes a digital mold of your tooth and sends it to a dental lab to construct your veneer. Temporary veneers will be placed at this time. At your next visit, once the veneer has been made, bonding is the process where the dentist ensures that the custom veneer fits your tooth perfectly. This is done by temporarily placing the veneer on your tooth and examining its measurements in comparison with the tooth’s measurements. In order to achieve a highly accurate fit, it needs to be adjusted and re-adjusted until it’s perfect. 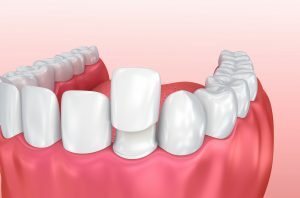 After all adjustments have been made, your tooth or teeth are prepared to receive the veneer(s). Preparing your tooth or teeth involves cleaning and polishing it, and then etching it. The tooth is etched to roughen its surface, allowing the bonding to be stronger between the tooth and the veneer. A special cement is applied to the veneer and then the veneer is placed on top of the tooth. The dentist will then shine a beam of light to the veneer. This beam of light activates the binding chemicals in the cement causing it to harden fast. Excess cement can be removed and an evaluation of your bite is done. The dentist will then schedule a follow-up visit to see how you are getting along with the veneer. After getting a dental veneer, you need to continue maintaining good oral hygiene. A veneer does not require any special attention, but you want to be sure to continue brushing your teeth twice a day and flossing once a day. It’s also important to continue attending your semi annual dental visits to clean and polish your teeth. We offer dental veneer applications to help you smile confidently and as a way of correcting what you don’t like about your smile, without much wait time. At 5 points advanced dentistry we can help you choose the right color, size, shape, and structure of veneer for the best results. Contact us today for more information about our products and services. Or, book an appointment and you will meet with Dr. Imm to discuss the best dental procedures for your needs.